You get to decide when to include the one signature you’re allowed to create in Outlook.com. Your signature for business might be very grand and official — the better to impress lackeys and sycophants as well as to intimidate rivals. In that case, you might prefer to leave it off the messages you send to your friends — unless, of course, your only friends are lackeys and sycophants. Then, lay it on thick, Your Royal Highness! 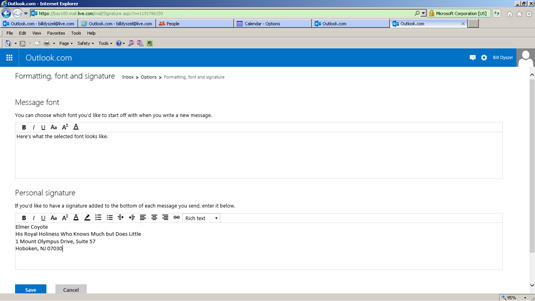 From Outlook.com Mail, click the gear icon at the top of the screen. Click the words Formatting, Font and Signature under Writing Email. The Message Font and Signature dialog box opens. Create a signature for Outlook.com. You can style the text using the formatting buttons at the top of the screen. The Options dialog box closes. After you create a signature, it goes in every email message you send. Of course, you can always delete the signature before you send an email. Also, if you choose Message Font and Signature in the Options menu, you can change the font and point size of your emails. Just follow the preceding instructions, but make your selections within the Message Font part of the dialog box. Bear in mind that the signature you created on your desktop won’t automatically appear when you send messages from Outlook.com. You have to enter your signature in both places.